A leading publisher of Genre Fiction, Pro Se Productions announces the release of the first volume in a new series from Author James Hopwood. 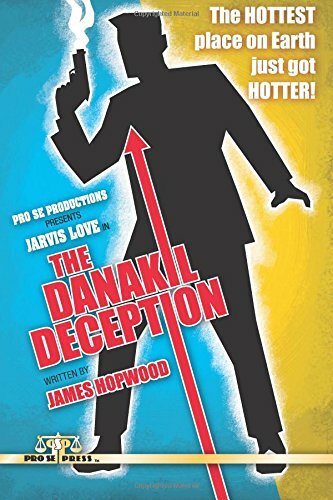 Cast in the classic mold of 1960s and 70s men of espionage and intrigue, Hopwood brings his enigmatic man of mystery, Jarvis Love, to Pro Se in The Danakil Deception. When archaeologists at the Danakil Depression in Ethiopia – the hottest place on Earth – discover a ruby measuring six feet in diameter, the world's scientific community is thrown into a spin. But it's not only scientists who are interested in the discovery. In the wrong hands, the ruby could be used to power a terrifying weapon – a weapon that could change the fate of the world. ...The clock is ticking, and only Love can stop the madman. Filled with hair-raising action and wild chases, The Danakil Deception is an edge-of-your-seat adventure that harks back to the great spy novels of the sixties, but infused with the high-octane punch of a modern thriller. The HOTTEST place on Earth just got HOTTER! The Danakil Deception features a fantastic cover and print formatting by David Foster and is now available in print on Amazon and via Pro Se’s own store at http://tinyurl.com/nym72mt for $15.00. The debut volume of the Jarvis Love series will be available in eBook format in the coming days. AUTHOR THAD BROWN BRINGS THE SMOKING GUN SISTERHOOD TO PRO SE SINGLE SHOTS- HOT SUN, HOT LEAD DEBUTS!